I thought today I would present a few of my favorite modern baby gear picks, some of them have become quite well-known, but for all those who haven’t heard of them, or have only seen them and would like to know more, here is today’s feature. Interestingly, I am starting the day with some Scandinavian design again, yes there really has to be something in the air in Europe’s north, that makes people create such great designs, or perhaps it is the long, dark winters. After I have introduced several Danish and Swedish companies, I will be talking about Norway based Stokke, though they have gained world-wide reputation by now and are not limited to Scandinavia anymore, of course. I know the Stokke Xplory is a ‘love it or hate it’ product because of its unusual design. While some people prefer the ordinary everyday stroller, others, like me, are really fascinated by Stokke’s fresh design approach. The idea of having your child sit high in the stroller is so ingenious, since we know babywearing is the best for bonding with your baby and having good communication, but sometimes we are just too tired to be carrying the precious bundle for hours on end. So the Xplory is a great alternative, if you are looking for a stroller that allows you to stay in contact with your baby. Being higher up has many advantages, for example little children are out of harms way from dogs and exhaust fumes. Also, they are able to see more of their surroundings, which is again nice because it gives the parents many opportunities to explain what is happening around them, and can make children more interested and inquisitive, and thus support their mental development. Not to forget that the Xplory can also be used as a highchair when out, so there is no need to use the icky ones the restaurant provides, or despair because there aren’t any available. But having your child sit higher is not only great for children, it is advantageous for parents as well, especially tall parents, because it prevents backaches when bending over to pick up your baby. There are even more advantages for tall parents: Handlebars easily adjustable to any hight, and an open frame that won’t be hindering parents from taking long strides, as there is no cross bar that gets in the way. I also think the idea of having a shopping bag instead of a shopping basket is pretty smart, as it can be detached from the stroller and be taken with you, so there is no need to repack your groceries. The last feature I love about this stroller is the wheel collapse machanism, designed to make going up- or dow-stairs a breeze. Of course there are also numerous seating positions possible, you can also get a carseat adapter, and the Xplory is just oh so beautiful and unique looking! This baby lounger truly is the most beautiful out there, isn’t it? So stylish in fact, it fits right into any contemporary home and wouldn’t you just love to use it yourself if it were of appropriate size? 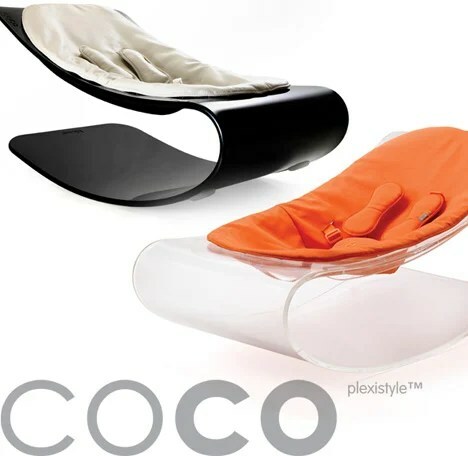 The coco lounger by bloom, one of the greatest companies if you are looking for modern children’s design, is available in two versions, coco plexistyle and coco stylewood. Both variants are produced in a multitude of color combinations, from clear with orange to brown with white. All models look equally great, so it will be a tough decision, which one to get! The coco lounger is made of a single piece frame, which increases durability and provides pleasing aesthetics, and it features a self-rocking function, soothing for baby. Furthermore, the seatpad is made of microsuede or leatherette, wipes clean easily, is of course cozy and comfortably padded and adapts to a growing baby with the adjustable, integrated 5-point harness. Don’t you just love all these wonderful items that can combine great functionality with superb style? To make things even better, the single piece frame also means no assembly is required, and new padding can be bought separately. Available at a lot of modern baby gear stores, such as Spunkysprout, where the coco plexistyle retails for $350 and the coco stylewood for $200. The second great design find for today also comes from Sweden. Aren’t these stroller bags called ‘retro revolution’ and ‘cherry blossom birds’ just awesome? They are made by Elodie Details and feature not just great design, but true functionality as well, for example compatibility with a 5-point harness and a wind and water repellent nylon surface. This hip brand also has some other chic design in store: For strolling in style, in the same cool retro revolution theme, you can also get also get baby bottles, binkies & clips. Plus, there are many other great styles available, such as this petit royal sippy cup below.